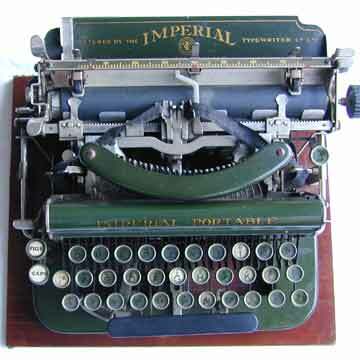 The Imperial D, or, in a slightly slimmed-down version, the Imperial Portable, was the fourth and last in the line of downstrike typewriters produced by the Imperial Typewriter Company. The machine appeared in 1919, 11 years after the introduction of the system, and was sold for quite some years. The Imperial D shows how successful the basic design of the Imperial was. There were only minor differences between the models A and B and the model C was identical to the B except for the aluminium frame. The only difference between the D and earlier machines was the straight keyboard. For the rest, the machine was virtually identical, including the interchangeable type baskets (pics 5 and 6). The Imperial Portable was produced in green, like this one, and black. A wide carriage version was also available. After the model D, the Imperial factory took up the production of 'modern' frontstrike typewriters of good quality but of little historical interest.